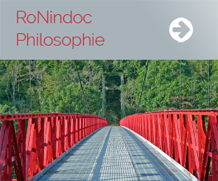 My applied RoNindoc philosophy is a non dogmatic life style, pure purpose in life and free development of personality based on non stigmatized life values, traditional and historical experiences as well as personal discipline. As Ronin, I am not bound by unimaginative decisions of gerontocratic senior staff and autistic politicians and can develop my own approaches with unconventional methods. Samurai (Japanese for "serving") were the armed escorts of the nobility, and later members of the warrior caste, which, according to a strict code of honour lived, the "Bushido" (Jap. "Way of the Warrior"). They went through a long and excellent education in various disciplines. Masterless samurai could call themselves no longer samurai, so they called themselves “Ronin”* (Jap. literary "wave men" – Jap. "ro" for drifting or "as reflected waves thrown back and forth" and "nin" for men, who were tossed around [in society] – or just "outcasts"). The most famous story on this subject is that of the “47 Ronin”. In 1701 Lord Asano no Ako had to do seppuku (hara - kiri = cut belly) after he had drawn his sword in the imperial palace bare against the bribe horny master of ceremonies of the court. After his sudden death his accompanying Samurai and loyal followers were without support in a then very uncertain world. All that remained for them was their intelligence, their discipline and courage. Society was changing towards the end of the last but one century in Japan and gradually the influence of the "traditional" samurai with two swords waned. More and more of these extremely well trained and educated soldiers were Ronin, some were teachers, murderers, monks, bandits or traders - such as Yataro Iwasaki - the founder of Mitsubishi. One of the most famous Ronin was Miyamoto Musashi was (1584 ~ 1646). and takes moral judgments on himself, too. and himself to be content with poverty. and never cherishes resentment against anybody.